We wrote recently regarding the Auditor-General's Report "Making the best use of public housing". One of the elements the Audit spent a bit of time considering was the 'efficiency' of allocating tenants with houses that fit their needs. The particular statement that caught our eye was that "only 67.6 per cent of public housing households match the size of the dwelling." 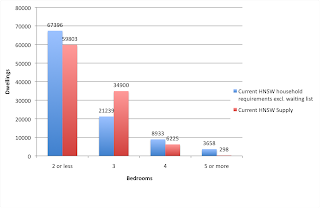 The figure of 16180 properties that have 2 or more spare bedrooms keeps coming up- it came up again in the Family and Community Services budget estimates recently. What isn't mentioned, and doesn't seem concerning to the auditor or the government is that of the 32.4% of public housing households that do not match the size of the dwelling, more than half, or 16641 dwellings, are actually over-occupied. This includes 2482 properties that are chronically over-occupied (they require at least 2 more bedrooms than they currently have). 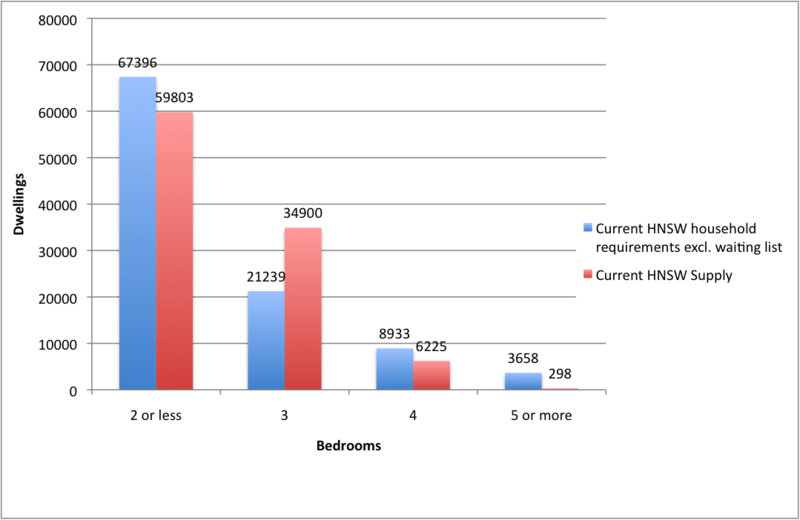 HNSW estimates in the Audit that under-occupancy costs the government about $25million in lost revenue a year, but fails to mention it is currently collecting roughly the same from people who are paying to stay in premises that are less than their requirements, as determined by HNSW. Of course, the government might argue, we must move those people who are under-occupying into the smaller places so that those who are over-occupying can move in. This might be sound accounting practice, but the focus on under-occupying misses a key point- these figures show they do not have somewhere for the over-occupying to move to. If we were to assume a zealously efficient overlord position and move people around in a state-wide game of human Tetris, we might try to make a straight swap between the 6230 people currently living in 1-2 bedrooms who require a 3 bedroom property, and 6230 of those living in 3 bedrooms who only require one or two (and hope that those who actually require two get two and not one), then we are still short 7230 places for those in under-occupied 3 bedroom premises. Those in 3 bedrooms who require 4 outnumber those in 4 bedrooms who require 3 more than four to one. Let's move everyone around, trying to house those over occupying in the premises that are under-occupied, and vice versa. Using Housing NSW's numbers we end up with 13661 households who don't fit the dwellings. There are lots of 3 bedroom places that people could be moved into. However, 7593 actually only require two bedroom places, and 6068 require four or more bedroom dwellings that don't exist. So we would still both have under-occupation, and over-occupation. This is a best case scenario for our efficient overlord, and it ignores things like ensuring tenants are moved within localities. What we are left with is that all this talk of under-occupation will only deal with anyone on the waiting list if we continue to leave people cramped and squashed into premises that are too small- by Housing NSW's own standards. We're for the efficient use of public housing, but becoming overly occupied with the amount of under occupation distracts government from its real issue- supplying adequate housing for the people who truly need it.